The concrete that is obtained by mixing the basic ingredients cement, water and aggregate will give us normal strength concrete. The strength of these type of concrete will vary from 10 MPa to 40MPa. The normal strength concrete has an initial setting time of 30 to 90 minutes that is dependent on the cement properties and the weather conditions of the construction site. The plain concrete will have no reinforcement in it. The main constituents are the cement, aggregates, and water. Most commonly used mix design is 1:2:4 which is the normal mix design. The density of the plain concrete will vary between 2200 and 2500 Kg/meter cube. The compressive strength is 200 to 500 kg/cm2. 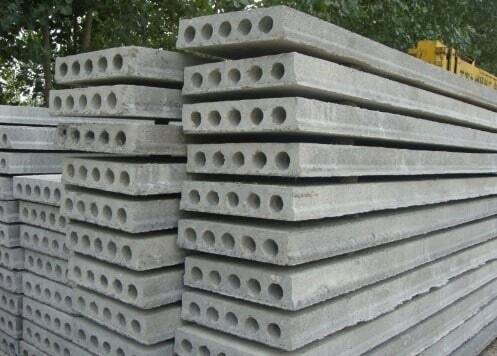 These types of concrete are mainly used in the construction of the pavements and the buildings, especially in areas where there is less demand of high tensile strength. The durability given by these type of concrete is satisfactory to high extent. The reinforced cement concrete is defined as the concrete to which reinforcement is introduced to bear the tensile strength. Plain concrete is weak in tension and good in compression. Hence the placement of reinforcement will take up the responsibility of bearing the tensile stresses. R.C.C works with the combined action of the plain concrete and the reinforcement. 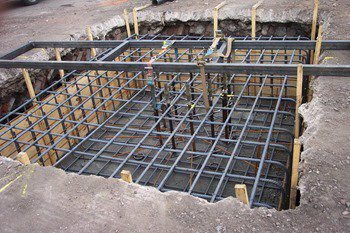 The steel reinforcement used in the concrete can be in the form of rods, bars or in the form of meshes. Now fibers are also developed as reinforcement. Fiber reinforced concrete are concrete that use fibers (steel fibers) as reinforcement for the concrete. Use of meshes in concrete will give ferrocement. Whatever be the type of reinforcement used in concrete, it is very necessary to ensure proper bond between the concrete and the reinforcement. This bond will control the strength and the durability factors of the concrete. Also Read: Why Select Reinforced Concrete as Construction Material for a Structure? Most of the mega concrete projects are carried out through prestressed concrete units. This is a special technique in which the bars or the tendons used in the concrete is stressed before the actual service load application. During the mixing and the placing of the concrete, these tensioned bars placed firmly and held from each end of the structural unit. Once the concrete sets and harden, the structural unit will be put in compression. 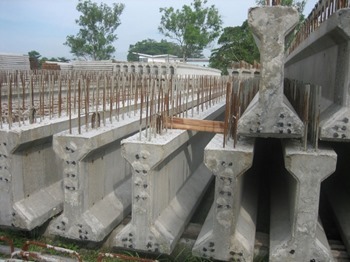 This phenomenon of prestressing will make the lower section of the concrete member to be stronger against the tension. The process of prestressing will require heavy equipment and labor skill (jacks and equipment for tensioning). Hence the prestressing units are made at site and assembled at site. These are used in the application of bridges, heavy loaded structures, and roof with longer spans. Various structural elements can be made and cast in the factory as per the specifications and bought to the site at the time of assembly. Such concrete units are called as the precast concrete. The examples of precast concrete units are concrete blocks, the staircase units, precast walls and poles, concrete lintels and many other elements. These units have the advantage of acquiring speedy construction as only assemblage is necessary. As the manufacturing is done at site, quality is assured. The only precaution taken is for their transportation. Concrete that have a density lesser than 1920kg/m3 will be categorized as lightweight concrete. The use of lightweight aggregates in concrete design will give us lightweight aggregates. Aggregates are the important element that contributes to the density of the concrete. The examples of light weight aggregates are the pumice, perlites, and scoria. The light weight concrete is applied for the protection of the steel structures and are also used for the construction of the long span bridge decks. These are also used for the construction of the building blocks. The concretes that have densities ranging between 3000 to 4000 kg/m3 can be called as the heavyweight concrete. Here heavy weight aggregates are used. The crushed rocks are used as the coarse aggregates. The most commonly used heavy weight aggregates is Barytes. These types of aggregates are most commonly used in the construction of atomic power plants and for similar projects. The heavy weight aggregate will help the structure to resist all possible type of radiations. These are concrete types into which air is intentionally entrained for an amount of 3 to 6% of the concrete. The air entrainment in the concrete is achieved by the addition of foams or gas – foaming agents. Some examples of air entraining agents are resins, alcohols, and fatty acids. The ready-mix concrete is very precise and specialty concrete can be developed based on the specification with utmost quality. The manufacture of these concrete will require a centralized mixing plant. These plants will be located at an adjustable distance from the construction site. If the transportation is too long then it will result in setting of concrete. Such issues of time delay are cope up with the use retarding agents that delays the setting. When compared with the conventional concrete, in polymer concrete the aggregates will be bound with the polymer instead of cement. The production of polymer concrete will help in the reduction of volume of voids in the aggregate. This will hence reduce the amount of polymer that is necessary to bind the aggregates used. Hence the aggregates are graded and mixed accordingly to achieve minimum voids hence maximum density. The concretes that have strength greater than 40MPa can be termed as high strength concrete. 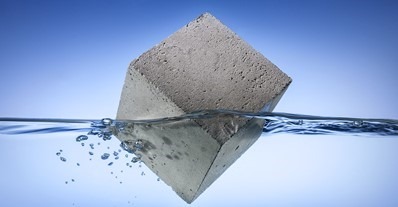 This increased strength is achieved by decreasing the water-cement ratio even lower than 0.35. The calcium hydroxide crystals that are the major concern product during hydration for the strength properties is reduced by the incorporation of silica fume. In terms of performance, the high strength concrete ought to be less performing in terms of workability which is an issue. These concretes conform to a particular standard but in no case, will be limited to strength. It has to be noted that all the high strength concrete can be high-performance type. But not all high-performance concrete (HPC) are high strength concrete. The concrete mix when placed will compact by its own weight is regarded as self-consolidated concrete. No vibration must be provided for the same separately. This mix has a higher workability. The slump value will be between 650 and 750. This concrete due to its higher workability is also called as flowing concrete. The areas where there is thick reinforcement, self – consolidating concrete works best. Here the concrete type differs in the way it is applied on the area to be cast. The concrete is shot into the frame or the prepared structural formwork with the help of a nozzle. As the shooting is carried out in a higher air pressure, the placing and the compaction process will be occurring at the same time. Pervious or permeable concrete are concrete that are designed such a way that it allows the water to pass through it. These types of concrete will have 15 to 20% voids of the volume of the concrete when they are designed. The pervious concrete is created by unique mixing process, performance, application methods etc. These are used in the construction of pavements and driveways where storm water issues persist. The storm water will pass through these pervious concrete pavements and reach the groundwater. Hence most of the drainage issues is solved. Concrete with water content more than required quantity is poured into the formwork. The excess water is then removed out with the help of a vacuum pump without waiting for the concrete to undergo setting. Hence the concrete structure or the platform will be ready to use earlier when compared with normal construction technique. These concretes will attain their 28 days compressive strength within a period of 10 days and the crushing strength of these structure is 25 % greater compared with the conventional concrete types. One of the main property of the concrete used in large mega construction especially for the high-rise construction is the conveyance of the concrete to heights. Hence one such property of concrete to easily pump will result in the design of pumpable concrete. The concrete that is used for pumping must be of adequate workability so that it is easily conveyed through the pipe. The pipe used will be rigid or a flexible hose that will discharge the concrete to the desired area. The concrete used must be fluid in nature with enough fine material as well as water to fill up the voids. The more the finer material used, greater will be control achieved on the mix. The grading of the coarse aggregate used must be continuous in nature. 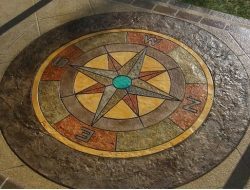 Stamped concrete is an architectural concrete where realistic patterns similar to natural stones, granites, and tiles can be obtained by placing impression of professional stamping pads. These stamping is carried out on the concrete when it is in its plastic condition. Different coloring stains and texture work will finally give a finish that is very similar to costlier natural stones. A high aesthetic look can be obtained from a stamped finish economically. This is used in the construction of driveways, interior floors, and patios. This is a concrete type in which the cement is replaced by lime. The main application of this product is in floors, domes as well as vaults. These unlike cements have many environmental and health benefits. These products are renewable and easily cleaned. Asphalt concrete is a composite material, mixture of aggregates and asphalts commonly used to surface roads, parking lots, airports, as well as the core of embankment dams. Asphalt concrete is also called as asphalt, blacktop or pavement in North America, and tarmac or bitumen macadam or rolled asphalt in the United Kingdom and the Republic of Ireland. These are concrete that is placed and compacted with the help of earth moving equipment like heavy rollers. This concrete is mainly employed in excavation and filling needs. These concretes have cement content in lesser amount and filled for the area necessary. After compaction, these concretes provide high density and finally cures into a strong monolithic block. As the name implies these concretes will acquire strength with few hours after its manufacture. Hence the formwork removal is made easy and hence the building construction is covered fastly. These have a wide spread application in the road repairs as they can be reused after few hours. The recycled glass can be used as aggregates in concrete. Thus, we get a concrete of modern times, the glass concrete. This concrete will increase the aesthetic appeal of the concrete. They also provide long-term strength and better thermal insulation also.